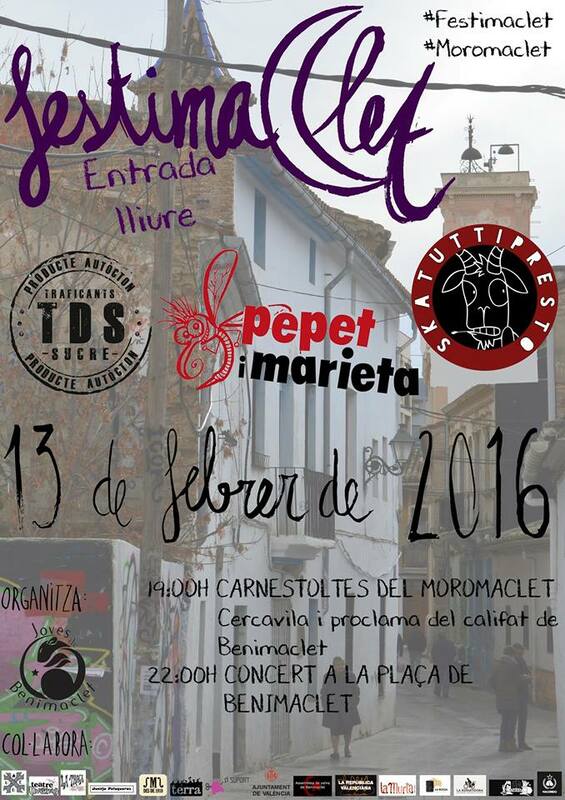 The annual Benimaclet carnival is back this year on the 13th of February. Festivities include a fire run courtesy of the local Colla de Dimonis and typical local music by the Colla Dolçaina i Tabal Roja de Benimaclet, organised by Joves Benimaclet and the Benimaclet neighbour’s association. Parades, dancing, castells (human towers) and communal meals follow. The Benimaclet carnival is usually celebrated one week after its famous counterparts in Tenerife and Cadiz, yet this year shares the same weekend under the new name of #Festimaclet. Just like other years we’ll witness the XXVIII Arribada del Moro Maclet or the 28th Coming of the Maclet Moor, which shows us that the carnival is not just being celebrated porque sí. 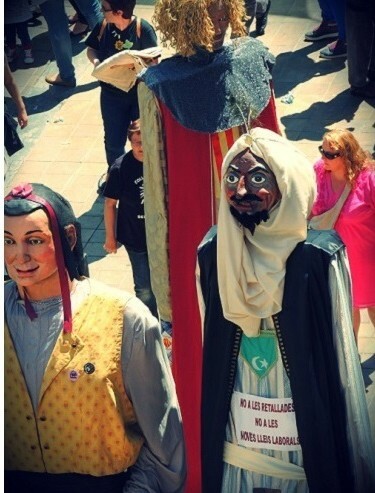 In fact, the residents of Benimaclet use the carnestoltes as a way of paying homage to the Maclet Moor who declared the independence of the Caliphate of Benimaclet… I think that’s to be taken with a pinch of salt, don’t you? Moro Maclet, a common fixture in Benimaclet fiestas, is the gegant seen in the image on the right. So don your best fancy dress costume and head to Benimaclet to join in the fun alongside the dolçaina and drum troupe and gegants parade. See the corre foc by the local dimonis, and then it’s time for dinner and to get your drink on. A free concert starts in the Plaza de Benimaclet at 10pm. One can HOPE that the village donkey will make an appearance this year too – and I’m not talking about the village idiot. Check out this clip from a previous carnival, filmed in Plaza de Benimaclet. Try as we might, we can’t find any back story to this tradition. Does anyone have any information about this curious dancing donkey? No doubt the priest will organize a special commemorative ringing of the bells over the weekend, too – just what the neighbours wanted. What happened to Dret al descans, señor cura? Consult a more detailed agenda and sign up for updates on the official Facebook event page. Enjoy the weekend!